The Augustine Band of Cahuilla Indians is a tribe whose story of surviving and thriving is compelling. To meet the requirement of developing a community impact piece, requested by the appropriate governmental entity, we detailed the tribe’s achievements, revenues, and contributions, all of which were substantial by any measure. 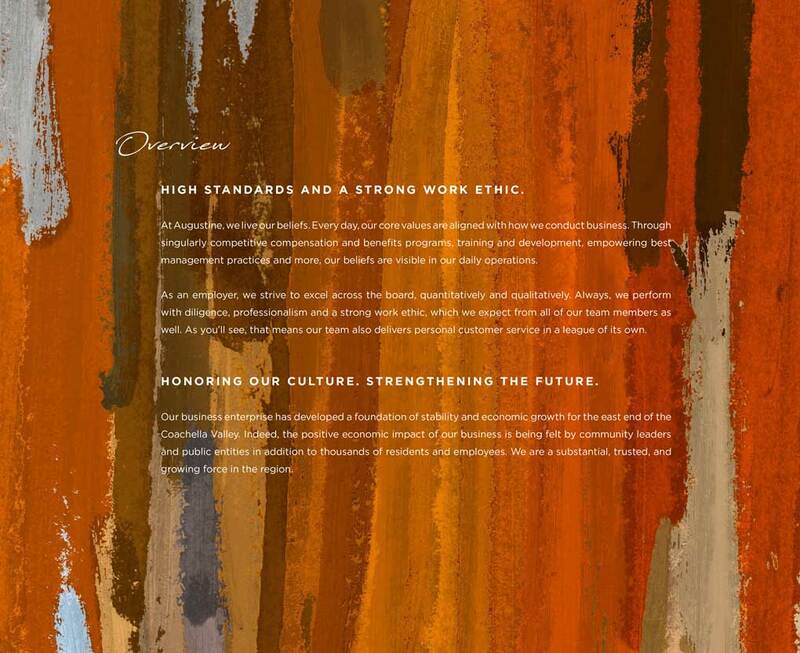 We created and produced a high-end, four-color marketing piece to communicate the tribe’s multifaceted narrative: a tale of courage and resolve in the face of adversity. With the line Cultivating Community. Powering Prosperity. The book tells a profound story with bold graphics, photography, and written content. It conveys how a tribe went from virtual nonexistence a few decades ago — with only one surviving adult tribal member, the great granddaughter of tribal founder Captain Vee-Vee Augustine — to becoming an economic powerhouse. 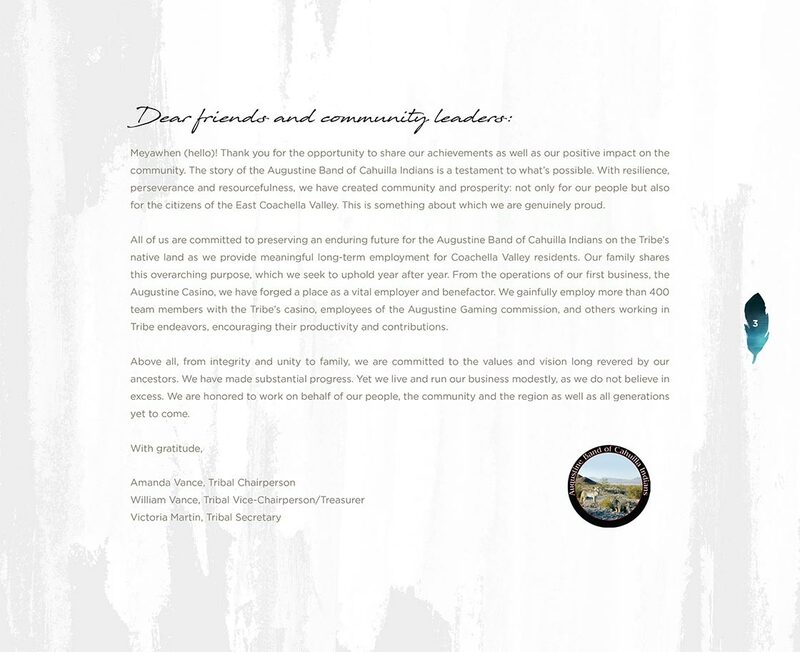 Now a major employer and philanthropist, the tribe provides financial stability and has become a trusted force in the region. With best management practices, competitive compensation and benefits, and an ironclad reputation, its impact is incalculable. To illustrate the long history and heritage, we featured a timeline depicting the tribe’s evolution from its ancient origins to today, and demonstrate how the legacy continues with a visionary new generation. 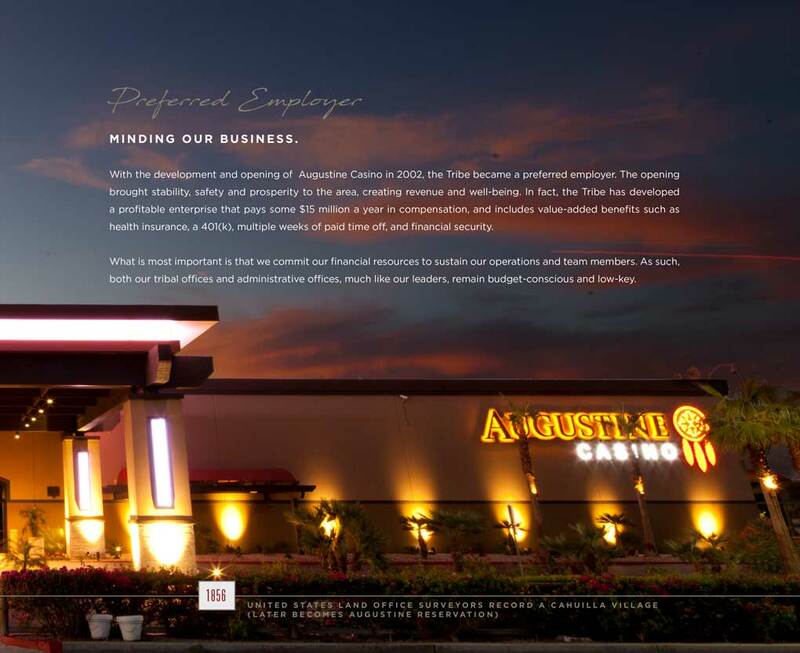 The piece showcases the tribe’s operations and contributions: a successful casino, solar enterprises, organic farming operations, and donations to 144 organizations and charities. Yet, it balances the impressive quantitative achievements with qualitative, enduring values including a culture of integrity and service, leadership, and stewardship of the land. Time to aspire to more?